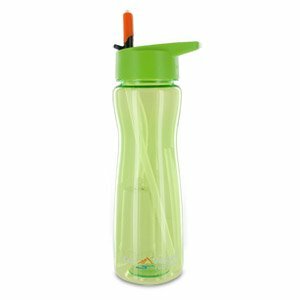 It's never been easier to enjoy clean, filtered water just about anywhere than with the Aqua Vessel Ultra Lite Tritan Filtration Bottle. This plastic, BPA-free bottle features a 25 oz. capacity and is ideal for camping, hiking, sports, and more! Plus, the water bottle comes with an internal filter that filters out 99.9% of Giardia and Cryptosporidium from your water, while also removing bad odors, bad tastes, and chlorine. The filter can easily filter up to 100 gallons of water, which equals over 500+ refills, while the water bottle itself is dishwasher safe for easy clean up between uses. Product Features 25 oz bottle allows you to easily enjoy clean, filtered water just about anywhere Ideal water bottle for camping, traveling, hiking, or just everyday use Internal filter easily removes over 99.9% of Giardia and Cryptosporidium while also removing bad odors, tastes, and chlorine Filter includes Miraguard antimicrobial technology which suppresses the growth of bacteria, algae, fungus, mold, and mildew, so the filter doesn't need special cleaning Filter was designed to filter up to 100 gallons of water, which equals over 500 refills Includes extra straw for use without the filter Water bottle is dishwasher safe for a quick and easy clean between uses Note: Filter does not protect against food-borne or disease-carrying bacteria, viruses, germs, or other disease-causing bacteria.